You may anxiously be awaiting for the day that your baby takes their first steps. It’s a huge milestone that should definitely be celebrated. Then brace yourself. Once the baby starts walking that’s all they’re going to want to do. That means a lot of exploration on their part. You need to get your home ready for that day. Put these important toddler safety tips to work. Before they walked, your baby probably spent a lot of time in the highchair seeing you go in and out of cabinets. They know that’s where all the good stuff is. That will be the first place they start looking. It’s also where the most dangerous stuff you have in the house could be lurking. This doesn’t mean you need to throw out all your cleaning products and medications but instead make sure there’s a secure lock on those cabinet doors and drawers. There are some terrific outlet guards that take an adult to use. You should switch out all of those plates. If you are using surge protectors (as you should! ), then you can also buy a protector that will keep their little hands out. A toddler will graduate from taking a bath in the kitchen sink to the actual bathroom. This is definitely not a time to turn your back on them. You should never leave them in a tub with water unattended even with just a few inches of water. There also going to do a lot of splashing. That remains setting up slip resistant mats in the tub and on the floor outside. Just to keep things very safe, you should make sure your water temperature is below 120°. That will greatly reduce the risk of accidental scalding. A recent video went viral that showed twin toddlers getting into trouble with a dresser that fell on top of them. Fortunately, they were okay but it points out the need to secure dressers and shelves to the wall. It’s too tempting for the kids to climb up to see what’s on top. 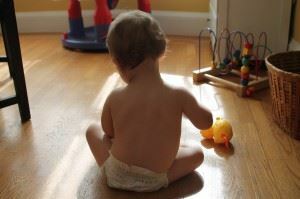 Speaking of temptation, you might have a lot of items around your house that your toddler would like to play with. Things like old computers, printers, monitors and appliances are something that they shouldn’t get a hold of. Those are the kinds of things you need to turn over to Junk King Chico. These are the professional junk haulers who know exactly how to dispose of that kind of e-waste. They can also remove a lot of other unwanted rubbish that may be cluttering up your closet and garage. Having a baby in the house means storage will become at a premium. Don’t waste that space with stuff you never going to use again. Let Junk King Chico help you make your home safe for toddler. This entry was posted in Junk King Gold Country and tagged clutter, Junk King Chico, junk removal, toddler on June 30, 2017 by Junk King. Last updated June 30, 2017 .